As I love experiments in food, I used to try varieties for lunch and dinner meals. So here am with a refreshing spicy fish fillet curry. A simple fish curry with fish fillet which i filleted at home. 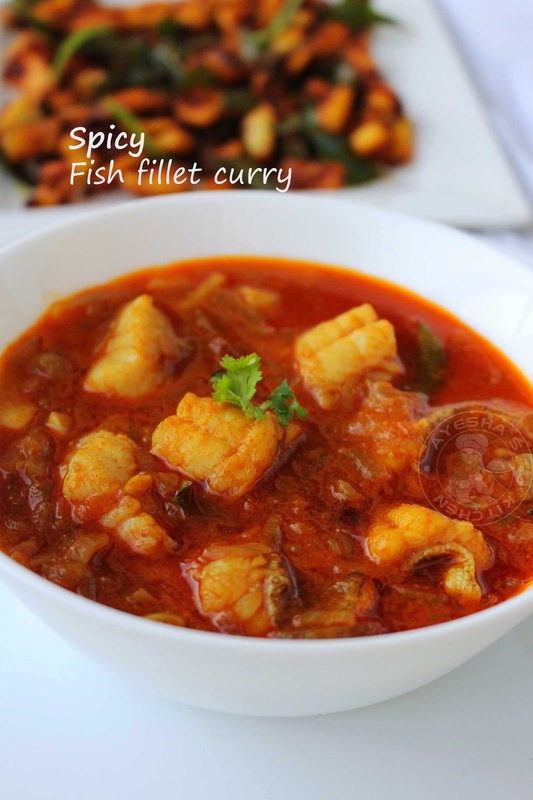 When ever i get bored of fish curry recipes, I try this quick and yummy version of curry recipe with fish fillet. Here I followed the recipe for chicken curry to make this spicy fish fillet curry. This tastes delicious when paired with rice, especially ghee rice. Though this is my first trial on spicy fish fillet curry, i loved this recipe. The meat of this curried fish was so soft and kids friendly. 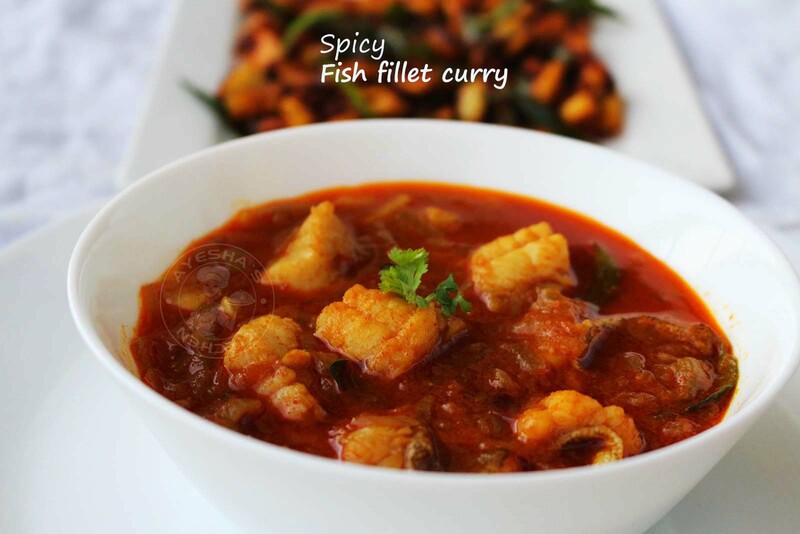 As most of the kids dislike eating fish, this curry is one of the best ways to make them eat fish. There are different varieties of fish available in the market. As an Indian, we are blessed with a variety of fish like king fish, mackerel, pomfret, pearl spot, Indian snapper,111 sardines and like so. Each fish tastes different with a unique flavor. Fish curry is the staple dish in Kerala, an Indian state where each curry tastes entirely different from place to place. The way of cooking, special ingredients, utensils used for cooking everything differs according to the region. Some fish are best for frying and some are best for curry recipes. As fish is considered as one of the best sources of protein, we must try to include this in our daily diet. They are the valuable source of omega 3 fatty acids which can regulate the flow of blood in our body and hence promoting mental health. Thus, fish is also known as the healthy brain food. This spicy curry is something really special. It is made with hamour fish which is filleted instantly. The tenderness of flesh when curried attracts me and my picky eaters. My elder kid dislikes eating fish, but this time she had this without even compelling. I really wondered on seeing that sight. So hope you all like this mouth watering fish delicacy and do try. Here is the recipe showing how to make fish curry /Indian fish curry /fish recipes /best fish recipes /fillet a fish/fillet of fish / hamour fish recipe/fillet recipe / easy fish fillet recipes. You can use store bought fish fillet for this curry. Or else you can make fish fillet at home. For that, you must sharpen your knife's blade. Then lay the filleting fish (clean and pat dry) on a cutting board. Here i fillet the fish from the tail. So place the knife down where the tail meets the body. Cut straight down gently until the knife hits the back bone. Now run the knife along the rib cage, separating the meat of the fish from ribs. Turn the fish over and repeat the same. Remove the pin bones with care as some fish meat is so delicate. Remove the belly portion of fish. And then skin the fish which is optional (i prefer to eat the skin). You can also start filleting the fish from the head, but it is too messy. So i prefer filleting from the tail. Make small pieces with this fillet and set aside. Heat a pan with oil and saute onion until golden and light. Then add crushed garlic, green chilies and saute well. To this, add chopped tomato and cook until mushy. Now add the spice powders along with salt. Mix well and cook for a while. When done, add half a cup of hot water or warm water. Cook until well combined or oil floats on the top. Now add the fish fillets. Let it cook well in this gravy. Once done, heat a pan with 1 teaspoon of oil and fry shallots chopped and curry leaves. Season the curry with it for a yummy flavor.